Shopfitting some of the most prestigious retail outlets in the UK and across Europe. Our shopfitting teams are second to none. We take pride in working to stringent time scales, whilst maintaining the highest standard of shopfitting workmanship. Whether it be an empty unit shell that requires dividing walls, electrics, painting, decorating and fixers or the installation of a concession stand in a large department store, Hyden UK always provide excellent quality of shopfitting service. We cover all areas of the UK, Ireland and Europe. An excellent example of our shopfitting workmanship is the Swarovski flagship store in Oxford Street London which is the largest Swarovski store in Europe. Another example of our work is the Marmot flagship store in the Westfield Stratford Shopping Centre which includes two living walls and a 7m rock feature at the front of the store along with a 4m rock feature at the rear of the store. We also supplied and installed freshly felled tree trunks. In 2011/12 we also built the first UK store for Lola & Grace in the Westfield Stratford Shopping Centre closely followed by a second store in Brent Cross. 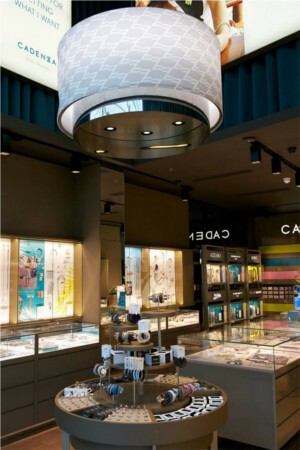 In June 2013, we built the first UK store for Cadenzza in Westfield Stratford City. Cadenzza is a new brand new high-end fashion jewellery store. The project, like all of our others, was built to a very high standard as shown in the photos in our Projects page. In 2011 Hyden carried out two installations in Harrods, London. We installed a concession in the luxury jewellery department on the 2nd Floor. We also built a 'pop up shop' in four of the main windows along Brompton Road. This was in place for four weeks before we had to dismantle and remove the fit out. Both projects were a huge success. We also pride ourselves on our concession stand construction and shop in shop installations. We have experience in most of the large department stores and continue to undertake projects in Debenhams, House of Fraser and Selfridges. If you would like further information on our Shopfitting services please Contact Us.